High performance air filter, K&N brand, lifetime warranty! K&N part number : HA-6098. Application: for Honda CBF500 from 2004 to 2008 (model code PC39). Most filters on the market are designed to be disposable: the filter element is made of strong paper and so cannot be cleaned without damage. K&N designs its filters differently: the filter material is a cotton felt, reinforced to give it a rigidity. This material costs more, but it provides durability. Another advantage of the filter material of K&N filters is that it slows the flow of air less than a paper element, while providing better filtration index ... It's all good! K&N air filters are guaranteed for life... and one million kilometers! However, it must be cleaned and oiled regularly - K&N cleaning kit available on our site. 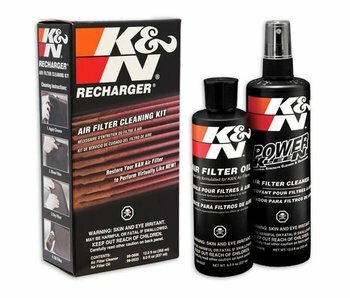 Cleaning kit for K&N air filters, including a cleaning spray and an oiling spray.